When you are tired, when you want to relax etc…What would you do? But, it is really simple if you know what kind of aroma oils you like and want to use for you. 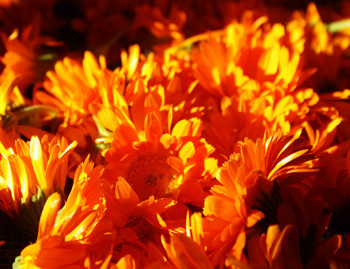 I use Calendula oil as a base oil, and put some my favorite oils into it. You might know the yellow flowers on the field, and amazingly the extract of this flowers have anti-viral, anti-genotoxic, and anti-inflammatory properties. Since ancient time, people keep this oil as one of home remedies to heal wound, cracked skin, abdominal cramps, constipation etc. So, I use this as a base oil, and put rose and geranium oils into it for my especially facial massage oil. For a facial massage, I put one drop of each oil. If you have any preexisting disease or pregnancy, please check any oil and do patch test before you use, or consult your medical doctor if necessarily.